While visiting the Simeone Museum, we had the distinct pleasure of having our arrival greeted by the sound of a Ford GT - 40 being started and moved into the service area. We had hoped for some additional aural delights that day, but with service needed the Ford would remain quiet during the remainder of our visit. 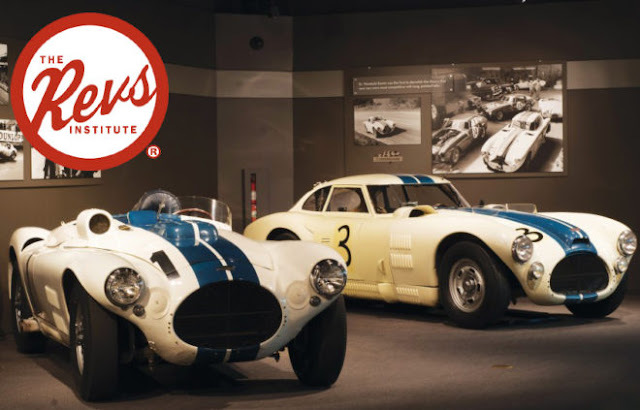 "The Revs Institute is the premier destination to study and explore one of the largest archives of automotive history ever preserved for scholars and connoisseurs alike." We later posted several videos from the REV's Institute at Stanford, where professors gave lectures about the world of automobiles and Collector cars (Stanford Presents - Cars: Past, Present, Future, Stanford Presents - What Will a Cultural History of Cars Look Like?, Stanford Presents - Of Hot Rodders and Hackers, Stanford Presents - Car Storytelling and Stanford Presents - New Technology is Eroding Driving Freedom). The REV's Institute's home is in Naples, Florida, also home of the Collier Collection. While nonsiderably more extensive that the Simeone Museum's "Demo Days", select vehicles are moved by truck from the Collier Collection Museum to Palm Beach International Speedway for "testing", which is another way of saying they get to drive these mechanical wonders around the track all day. Why, because cars need to be run every so often to keep them in top mechanical condition. They also race these thoroughbreds occasionally, so they need to be ready for "a pounding". We hope you enjoy these two videos of the preparation involved and an in-car video of their Ford GT - 40. BTW, the sound is intoxicating.